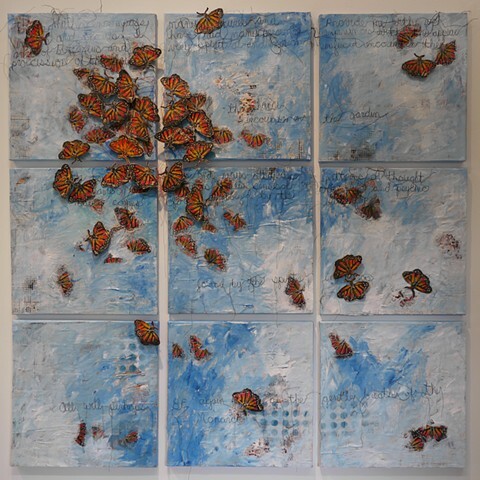 Thru the image of the monarch butterfly and fragments of text stitched into the surface of this piece I am exploring the conversation between life and death,spirit and soul. The beautiful ancient Mexican belief that the monarchs return each year after a 3000 mile migration as the souls of loved ones who have died expresses how we as people use myth and imagination to transcend loss and accept what cannot be truly known. What comes after death? What becomes of our lives and precious connection to each other. This movement between the planes of life and death...or life and life are interweaving moments from one to the other as an expression of the wish to connect with our loved ones in a continuum of the soul and breath. In Jung’s terms, ‘the psychic journey’s old ways, attitudes, patterns of thought, behavior and energies, a new sense of inner life and psychic reality comes forth, symbolized by the butterfly’.